SNUFF finds Commander Samuel Vimes in the Middle Shires of England, completely out of his natural habitat of the dark and dank capital city of Ankh-Morpork on the planet called Discworld. His beloved wife, Lady Sybil, who not only raises their young son, Sam Jr., but also breeds dragons as a hobby, has declared that Sam, Jr. needs to get in touch with his landed gentry roots. She also insists that her husband take a vacation. "SNUFF finds Commander Samuel Vimes in the Middle Shires of England, completely out of his natural habitat of the dark and dank capital city of Ankh-Morpork on the planet called Discworld." So Sam reluctantly turns over his badge and sword and all other weapons (except for those that can be secreted on his person without suspicious bulges) and sets off with his family and his gentlemen’s gentleman, Willikins, to the vast Ramkin family estate. They are met by a retinue of footmen, household servants, a butler and housekeeper, game keepers, gardeners, and even a hermit. Vimes settles in for a month of fresh air, birdsong, grazing cows, moonlight and constellations. He takes leisurely walks beside flowing streams with his son, identifying wildlife of a sort far different from that encountered in the city. Discworld is a planet of diverse population. Along with the usual assortment of humans and domestic livestock found on Earth, it is not out of the ordinary to hobnob with Gollems and witches, vampires, werewolves, dwarves or zombies, some of whom wear the uniform of the Ankh-Morpork City Watch under Vimes’s command. Goblins, however, are not found in Ankh-Morpork. Perhaps it is because they prefer to live in caves that, if there ever were caves in the ancient city, would all be flooded. In Ankh-Morpork, the waters of the River Ankh don’t flow, they ooze. Birds, should they accidentally venture above the city, would probably cough and plunge to earth, and no one has seen stars, let alone constellations unless they’ve been hit on the head with a truncheon. On Discworld, goblins are generally thought of as vermin and treated as such --- loathsome, smelly creatures useful for scaring children into behaving by chanting “Be good or the goblins will get you.” The idea that they may be sentient beings capable of speaking and creating music and artifacts has gone unnoticed so far. Sam soon senses, as he walks the streets of the village, that something is amiss in the idyllic atmosphere of sunshine and verdant pastures. His cop antenna fairly sizzles at an undercurrent of malice. A horrific crime has been committed on his land, and the entire village seems to be covering it up. The cop inside the vacationing lord of the manor cannot lay aside his sword and shield until he sniffs out the terrible deed. A sojourn in the countryside turns into an adventure on the high seas, roiling rivers and, gods forbid, even racing through a raging storm in the dark of night on horseback. The only thing in all of Discworld that Sam is afraid of is horses, but he must rely on one to bring a mass murderer to justice. Of his announcing that he has Alzheimer’s and the recent bestowal of Knighthood by Queen Elizabeth, Terry Pratchett tells his friend and fellow author, Neil Gaiman, “Ever since I stood up and talked about my Alzheimer’s I have been a public figure; I visited Downing Street twice, wrote angry letters to the Times, got into debates in the House of Commons, and generally became a geezer to the extent that I sit here sometimes bewildered and think to myself, 'Actually, your job is to sit here writing another book. Changing the world is for other people...' and then I come back to myself with, 'No it isn’t!' And so, bearing in mind that these days, people call a kid from the council houses “Sir” better allows me to create a mindset for (Commander) Vimes." 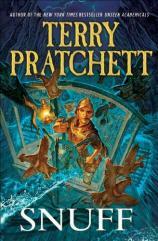 And so here is #37 in the Discworld series. Meet Sir Samuel Vimes.